A fast growing metropolis, the garden city of Bangalore is the capital of the southern Indian state of Karnataka. Situated at about 1000 meters above sea level, it is known for its salubrious climate where temperatures remain moderate throughout the year. It is well connected by air, rail and road to all major cities of the country and has direct international connections to many cities worldwide. The clean and spacious city of Bangalore has many imposing structures full of historic and modern architecture. The majestic Vidhana Soudha, a magnificent post-independence structure housing the State legislature and Secretariat, stands in the center of the city with its attractive dome and galleries. It is sheer delight to see the illuminated Soudha during nights on Sundays and Holidays. The city has several institutions of Learning and Research. Many of them such as the Indian Institute of Science, Raman Research Institute, National Institute of Mental health and Neuro-Sciences, National Aerospace Laboratories, Bangalore University have worldwide acclaim. The high-tech industries such as Aerospace, Electronics, Computers and now fast spreading software have made Bangalore their home due to easy access to a vast pool of scientists and engineers in the city. In the area of art and culture too, the city boasts of a rich heritage and tradition and has several schools of classical music and dance. The climate in Bangalore is basically dry tropical savanna climate. In the month of September the average temperature in Bangalore in February is fairly hot at 23.6 °C (74.48 °F). Afternoons can be very hot with average high temperatures reaching 30.1 °C (86.2 °F). Overnight temperatures are generally very mild with an average low of 17 °C (62.6 °F). The weather in February is arid with vitually no rain. A feeble 7mm (0.3in) of fluid is dropped across on average 1 day. How to reach IPIRTI from the Airport/Majestic/Bangalore City? Bangalore is well connected by air, rail and road to all the metropolises and most major cities of the country. Also, one can fly direct to Bangalore from several international airports IPIRTI is about 35kms from the airport. One could take either a prepaid taxiwhich costs Rs. 799/-, and the counter is available near the exit of the Airport Building, or a city taxi (costs about Rs. 700/- to 1000/-, which is just outside the airport building). You can tell them to take you to Platinum City which is near Peenya. Our Institute is adjacent to Platinum City. Additional information on the airport can also be found at its official website:(http://www.bengaluruairport.com/). If you use a Shuttle bus service, operated by Bangalore Metropolitan Transport Corporation (BMTC), then take a bus that runs from the airport to Bangalore city. Details of the schedule can be found here at its official website: http://www.mybmtc.com) From Bangalore City you have to catch another Bus from the same platform(Route No 258c or 250) or reach platform number 22 from where almost all buses going towards Nelamangala, Peenya, Bagalagunte, etc. has a stop near our Institute. You have to get down at CMTI Stop, cross the road and walk about 500mts to reach our Institute which is on the left side and in the beginning of HMT Link Road. How to reach IPIRTI through Metro from the Railway station/Majestic/Bangalore City? The city railway station is about 12 kms from IPIRTI. To reach IPIRTI you have to enter the Metro Station which is just opposite to the City railway Station and get into platform No. 1 to catch the Metro which is going towards Nagasandra. You have to get down at Peenya Metro Station and just behind the Metro Station is our Institute. 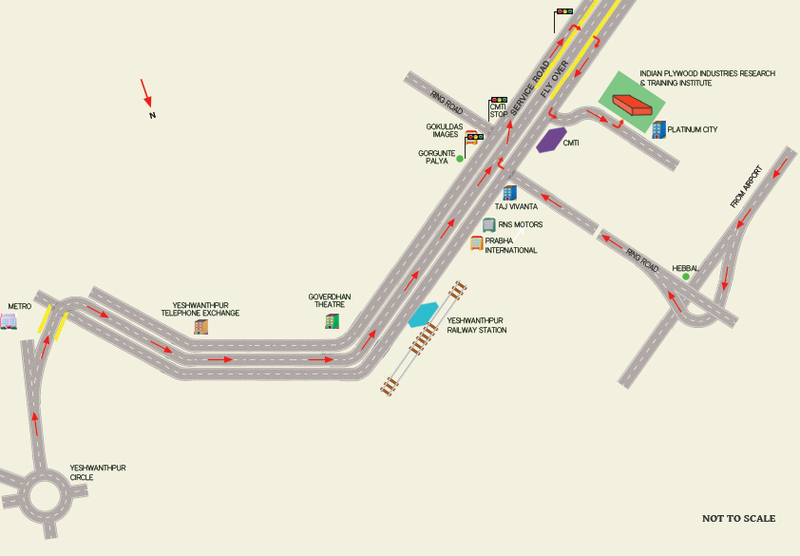 How to reach IPIRTI through BMTPC Busses from the Railway station/Majestic/Bangalore City? The city railway station is about 12 kms from IPIRTI. To hire a prepaid taxi to Platinum City(adjacent to IPIRTI) near Peenya(costs about Rs 150) one has to come out from the railway station from platform No. 1. If you want to use a Shuttle bus service, operated by Bangalore Metropolitan Transport Corporation (BMTC) then you have to cross the road and reach the central Bus stand which is just opposite to the City Railway station. You can take a bus from platform number 22 from where almost all buses come near the Institute. You have to get down at CMTI Stop, cross the road and walk about 500 mts to reach our Institute which is on the left side and in the beginning of HMT Link Road. One can also use pre-paid auto service to reach IPIRTI. Pre-paid auto service is located just outside the railway station and it costs about 140/- from the Railway Station to IPIRTI. How to reach IPIRTI from Yeshwanthpur Railway Station? The Yeshwantpura railway station is located less than 4 km from the institute. One can take a 'pre-paid' auto from the counter located outside the exit gate of platform number 6. The prepaid autos are best deal given the options available. The landmark is Platinum City. The other option is to catch a metro which is going towards Nagasandra and get down at Peenya Metro Station and just behind the station is our institute. © Copyright IPIRTI, Bangalore. All Rights Reserved. Designed by IPIRTI, Bangalore.